Oregon PowerSharp chain has unique, top-sharpening cutters and is low kickback. Its chisel-style cutters, ramped depth gauges and ramped guidance drive links provide a smooth and efficient cutting action and good chip flow. The diamond-coated dresser link resurfaces the sharpening stone, ensureing flat cutter to stone contact. The sharpening stone fits inside the bar-mounted sharpener. 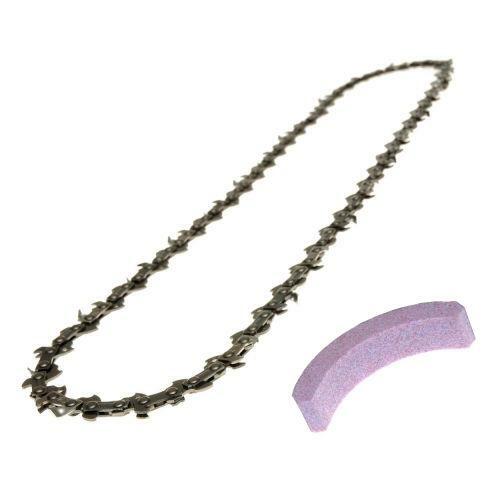 Matching the saw chain life, the stone should be replaced at the same time as the PowerSharp chain. Orders totalling over £50 are carriage free. For offshore / worldwide shipping locations just add to cart and checkout for a quote.